This is a unique opportunity to learn about Pat and learn from him. Take a look around and come back often to get the latest from this media pioneer and prolific author. Massive credit card debt, the housing foreclosure crisis, banks failing, stocks tanking, inflation looming, the government spending trillions on who knows what. Learn more today! Unlock the power of miraculous faith and will build your understanding to believe God for miracles in your life. Learn more today! Read Pat Robertson's landmark book, Courting Disaster. If you care about what's happening in America - you must read this book! Buy the book. View a slideshow of Pat's book tour. 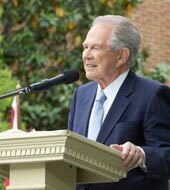 Pat Robertson examines recent court decisions regarding public display of the Ten Commandments and explores the rhetoric behind America's rejection of God's laws.